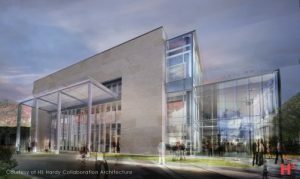 DAVENPORT is currently serving as part of the design team for this 100,000 square foot, 3,000-seat performance venue to be located at the corner of North Elm Street and Summit Avenue in Greensboro, NC. The site is a fully developed area of approximately 4.5 acres in downtown Greensboro, surrounded by North Elm Street on the west, East Lindsay Street on the north, Summit Avenue on the east and Bellemeade Street on the south. The existing buildings and parking lots will be removed with the exception of two or three buildings at the corner of North Elm Street and East Lindsay Street. The proposed development will include the construction of a single new building and surface parking. Given the challenge of designing in this heavily trafficked site, DAVENPORT is presently taking all factors into consideration and providing successful solutions that meet the City’s needs. DAVENPORT is currently providing site civil engineering services including site design, parking layouts, grading, utility relocation and design, drainage and erosion control design, materials inspections, storm water management, landscape design, site permitting and utility coordination for the development of the Steven Tanger Performing Arts Center. Soil borings were conducted to aide in the asphalt pavement and building footer designs.